You are here: Home > T-Mobile Sidekick 4G Now Available! 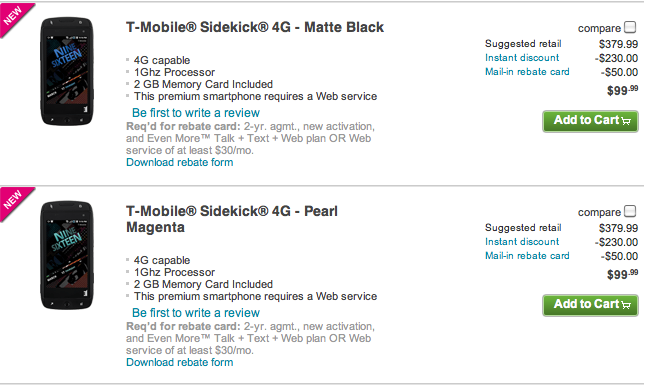 T-Mobile Sidekick 4G Now Available! As the Sidekick 4G find its way into the marketplace this morning T-Mobile finds itself revitalizing one of its best known brands with a handset that is in so many ways, wonderful. As I work toward our own review of the Sidekick 4G I’ll preface it by saying expect lots and lots of good mixed in with a little so-so. Moving past the review is our excitement that the day has finally arrived that the Sidekick is reintroduced to the world. Retooled and revamped the Sidekick 4G with its Android powered persona hopes to recapture the Sidekick memories of old with the Android memories of today. The Sidekick is available a terrific price of $99.99 with a 2 year agreement. Sporting HSPA+ 21 Mbps capability the Sidekick 4G is only the second handset in the T-Mobile lineup capable of hitting those theoretical speeds. If you managed to catch our own set of speed tests you’ll know the phone is fast, very fast. ← T-Mobile G2X Now Available In Stores! I’m glad that its back to satisfy it’s gynormous fan base. how much extra per month for Mobile Hot Spot/Tethering?? or is it free?? Some articles have said “for an extra charge” — any idea?? It’s free as long as you don’t abuse the privilege. Any android phone with OS 2.2 or higher has this capability. I thought it was just me, but I don’t either. Was planning on going to the store anyway, but I didn’t want to see it online. I went to the store this morning to pick up the sidekick and they couldn’t sell it to me yet because the system isn’t allowing upgrade sales until noon (central time). I guess you can only purchase it right now as a new customer. They must have mis-informed you jcarljr. I have mine in hand and I live in Houston. I went to T-mobile store purchased it 10:30am central time, setting it up now as I type. It was 411.74 taxes included. They couldn’t get it up in their system yet, but went back at noon and all is good! It might be an app. can a at&t sim card fit in the sidekick without switching to tmobile? I called to get mine .On its way . Anyone think the G2 will come down in price anytime soon? The SK has a faster CPU and radio, and it’s a lot cheaper. Not for a long time. Its not going to be outdated for a really long time. does the on screen samsung, not swype, keyboard come with a predictive words feature while in the messaging app? yes. any android phone does. I went today and got one. That was 8 hours ago, I’ve barely put it down since then. Heres what you wanna know about it-two cameras, one front, one back takes pretty decent pics. Video chat via the built in qik program is great. The phone is solid and the flip screen is nice. I hadnt experienced any issues yet. Sound thru headphones is good, internet is blazing. I installed flash to get the full website experience and it works great. The keyboard keys are spaced out and even with my fat fingers I can type good. I was thinkin about the g2x but im not taking this one back. Definitely worth it. The android is just kinda skinned but the same android overall like my optimus t which is 2.2. Tmobile tv is free for 30 days and it plays with no lag that I can tell. Get this phone, you will thank me later. And gotta thank ol Paul @ the plano store(park and preston) for being an excellent rep…got me in and out the store on my lunch break with the phone in 15 minutes flat!!! Question before i put my sim card in does the 4g Sidekick still have tmail with danger ending there service for the sidekick I doubt that it does .But i want to make sure .Do to the fact i have a lot of mail in drafts save in my t mail .Does anyone know if the 4g has tmail? That the same thing I am wondering… Did you find out yet?